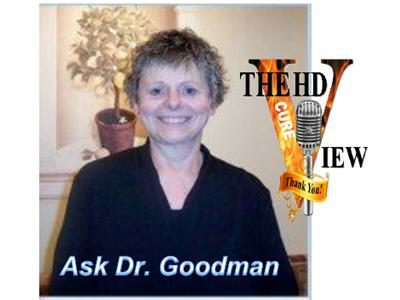 Monday, January 2, 2012 – Our incredible special guest is Dr. LaVonne Goodman who has graciously agreed to participate in our program series “Ask Dr. Goodman”. She is an expert in Internal Medicine and has treated Huntington’s patients for many years. Tonight’s topics will be IVF/PGD, termination and other options. These are very sensitive subjects for discussion, so we will take the utmost care and respect in the discussion panel segment of the show. We want to know from you, our listeners, what are your concerns or experiences about these topics? Send your questions to Melissa at help4hd@yahoo.com or visit www.help4hd-international.org to leave your comments there. Thank you as always for your interest in Help 4 HD and The HD View programming.